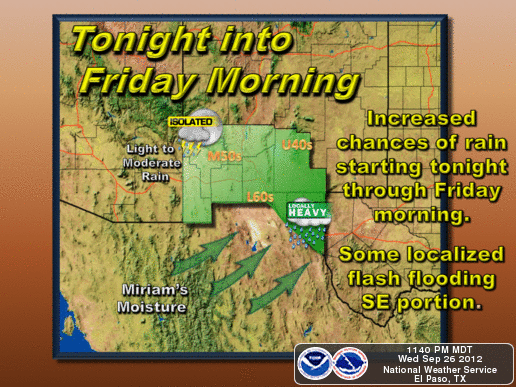 Heavy Rain & Flash Flooding Possible Today Into Saturday! 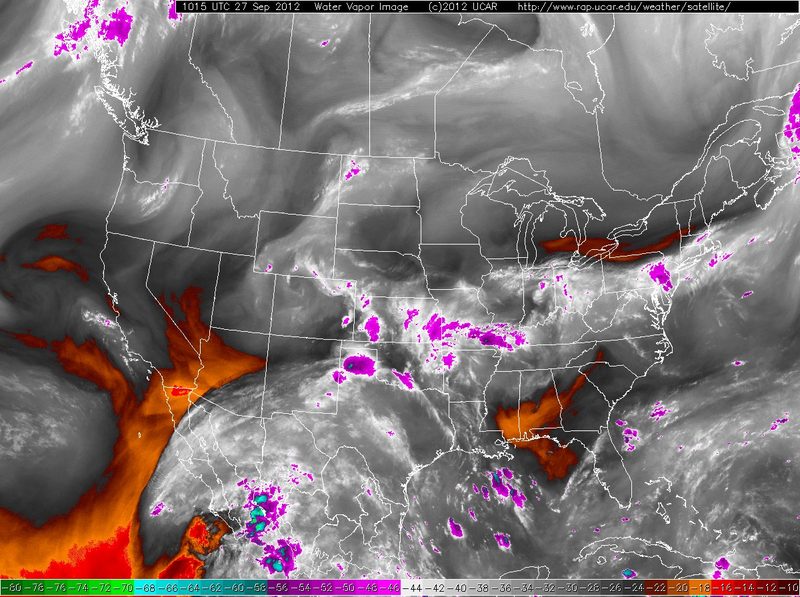 Water Vapor Satellite Image At 4:15 AM MDT. 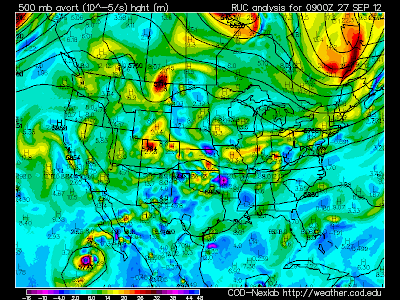 RUC 500 MB Analysis At 3 AM MDT. A long fetch of deep tropical moisture (remnants of former Hurricane Miriam) can be seen streaming northeastward from southwest of the Baja Peninsula, and into New Mexico and west Texas on the Water Vapor Satellite Image above. This deep fetch of moisture is being pulled into our state, and local area by a mid-upper level trough of low pressure centered over Colorado. 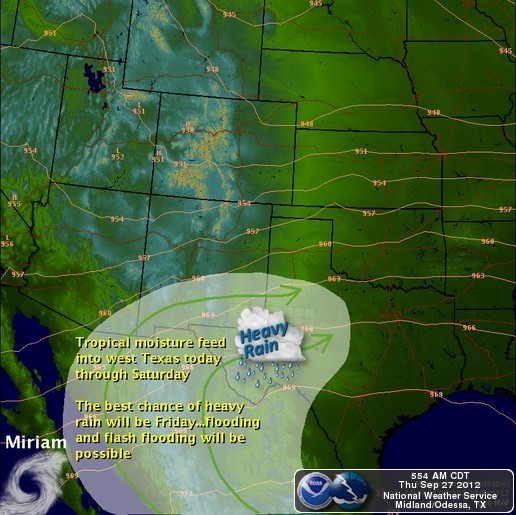 This remnant tropical moisture feed is forecast to continue streaming into our area into Saturday. Heavy Rain - Flash Flooding Today Into Saturday! 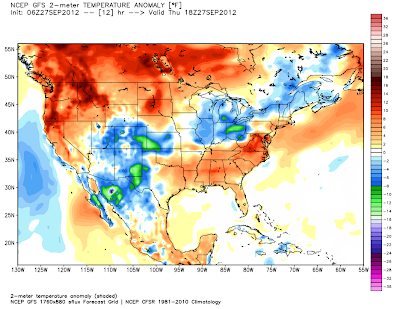 06Z GFS Temp Departure From Normal Forecast. Radar is showing scattered rain showers and a few isolated thunderstorms covering parts of Eddy and Lea Counties as of 5:30 AM this morning. 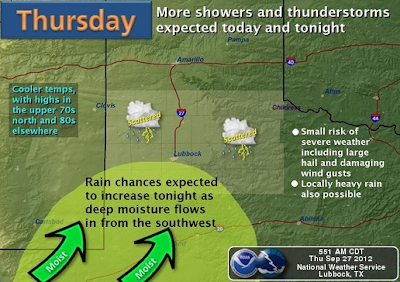 Clouds will continue to increase today as we see an increase in rain showers and thunderstorms later today. 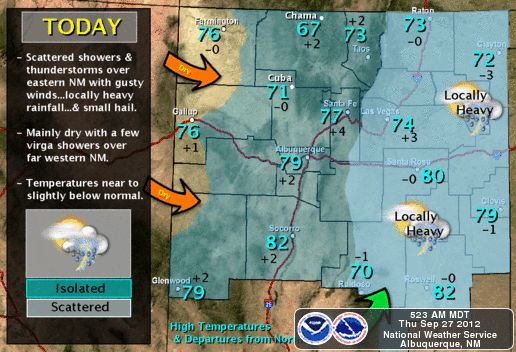 Our high temperatures are forecast to be in the low-mid 80's today, and these temps could be a little high depending upon the cloud cover and rain coverage. We are expecting to see our highs in the upper 70's to near 80 tomorrow into Sunday. Again, depending upon the amount of cloud coverage and rain that falls over the area, some of us may be cooler than this, especially on Friday and Saturday. 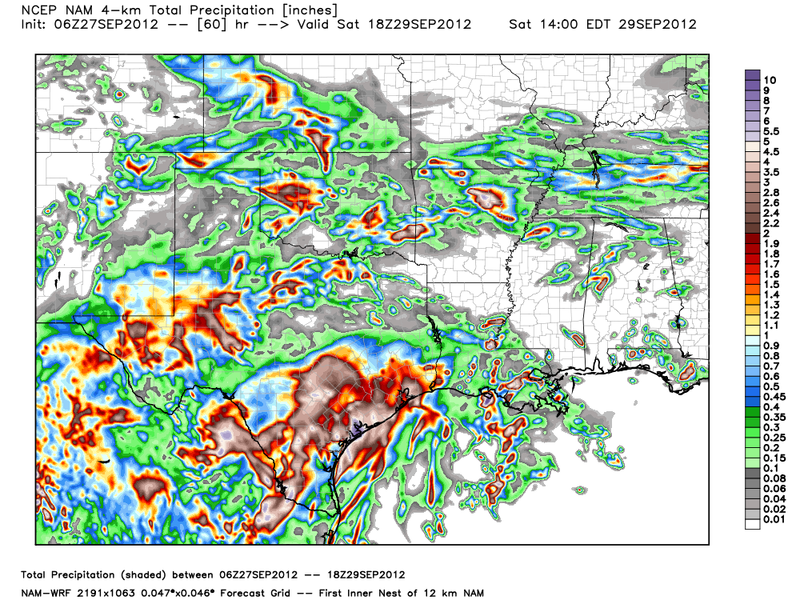 06Z NAM 4-KM 60-Hour Rainfall Forecast. 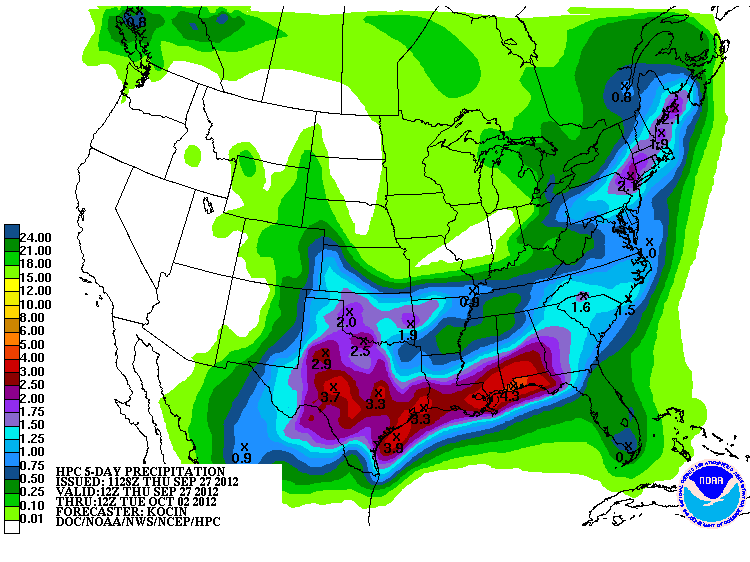 NWS HPC 5-Day Rainfall Totals Forecast. Special Weather Web Briefing From NWS El Paso. 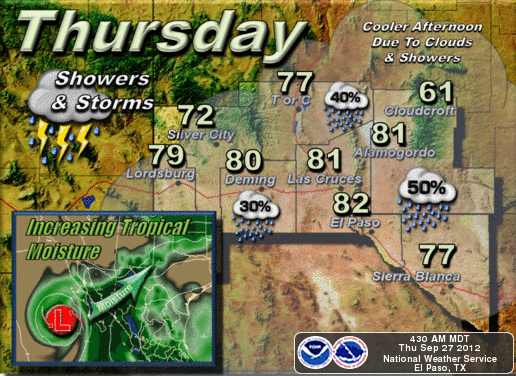 Heavy rains are looking more and more likely across southeastern New Mexico and parts of west Texas. Remnant tropical moisture from former Hurricane Miriam is being pulled northeastward into the area by a mid-upper level trough of low pressure centered over Colorado. 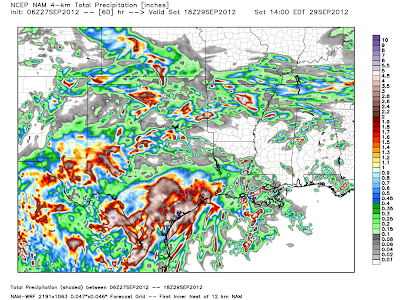 Short-range model forecasts indicate that rainfall totals by Saturday may be in the 1" - 3.00" range. This may vary some with some locations possibly receiving more than this and some locations receiving less. West Texas south and southeast New Mexico appears to be set up to see the heaviest rains, but any subtle shift north and west of the atmospheric parameters could bring more of this heavier rainfall into southeastern New Mexico. 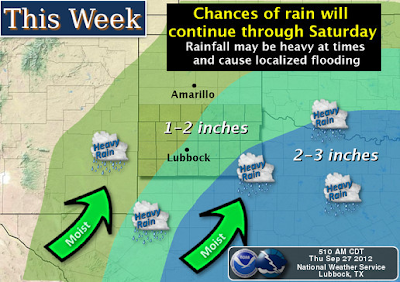 Flooding and flash flooding may be a problem for some areas across the area today into Saturday. 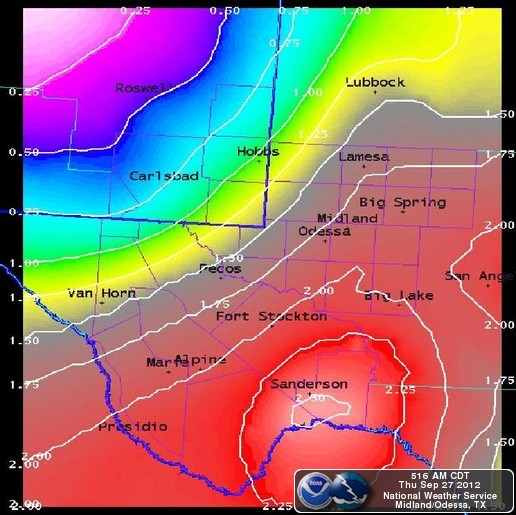 Remember that most flash flood deaths occur in vehicles, and at night when it is harder to determine the depth of the water on a flooded roadway. Never attempt to drive or walk across a flooded stream or normally dry arroyo.